Some Friends of the Soldiers Home volunteers felt so blessed to be part of the RT Chocolate Lovers’ Social, which took the place of the regular Happy Hour on Feb. 26. 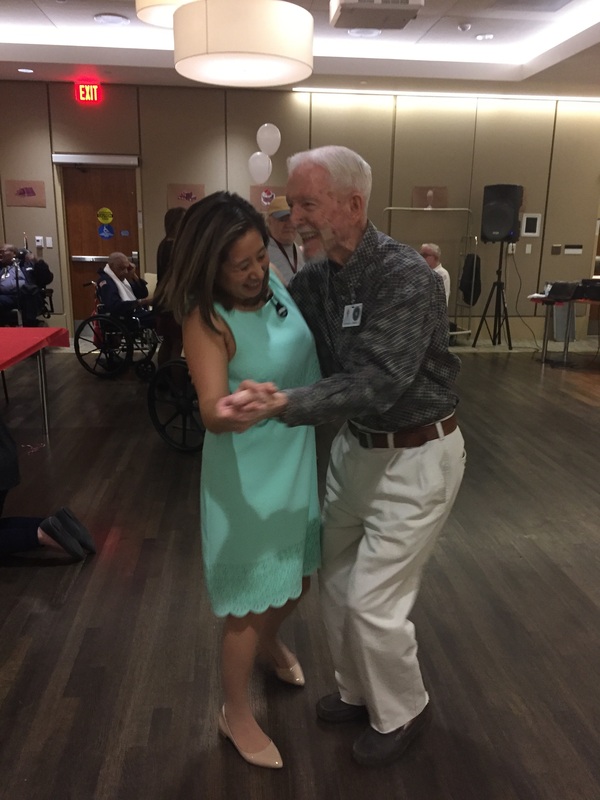 Resident Billy White spun tunes and many danced, and volunteers from Catholic University, the Nam Knights and Miss D.C. and Miss Foggy Bottom made the evening extra special. As usual, the AFRH staff did a fantastic job to make the evening memorable. Thanks to Lori Lincoln, the Friends of the Soldiers Home volunteer coordinator, for all these great photos! 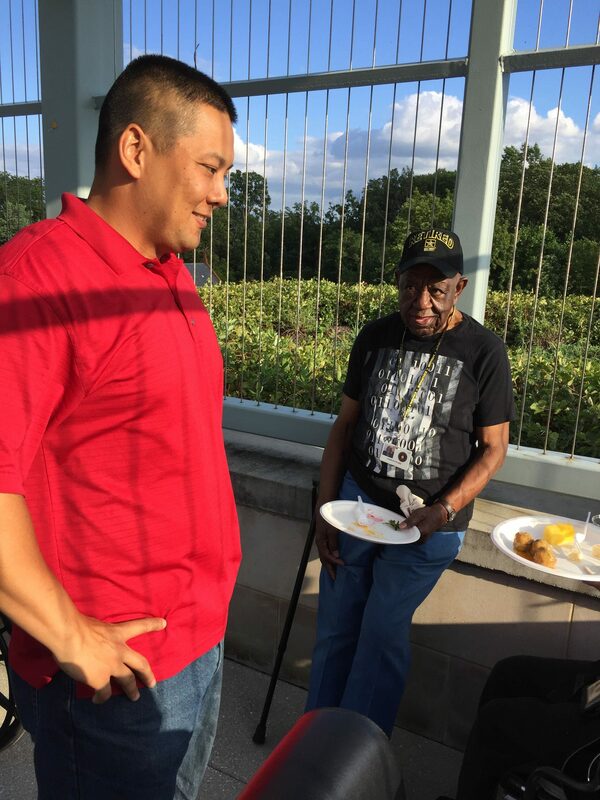 It was great to see the community and Soldiers Home-DC residents making connections at last night’s Happy Hour! 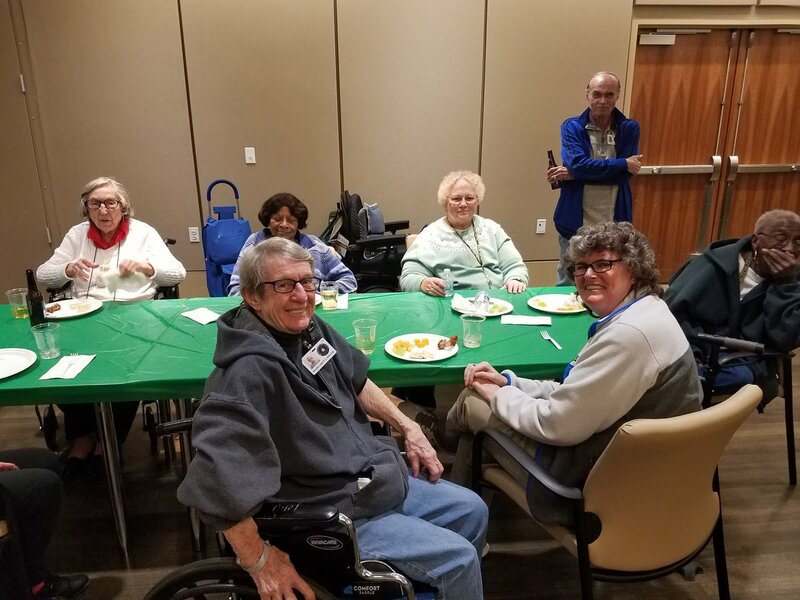 Friends of the Soldiers Home volunteers have been heading to Happy Hour for years, always the last Tuesday of each month. 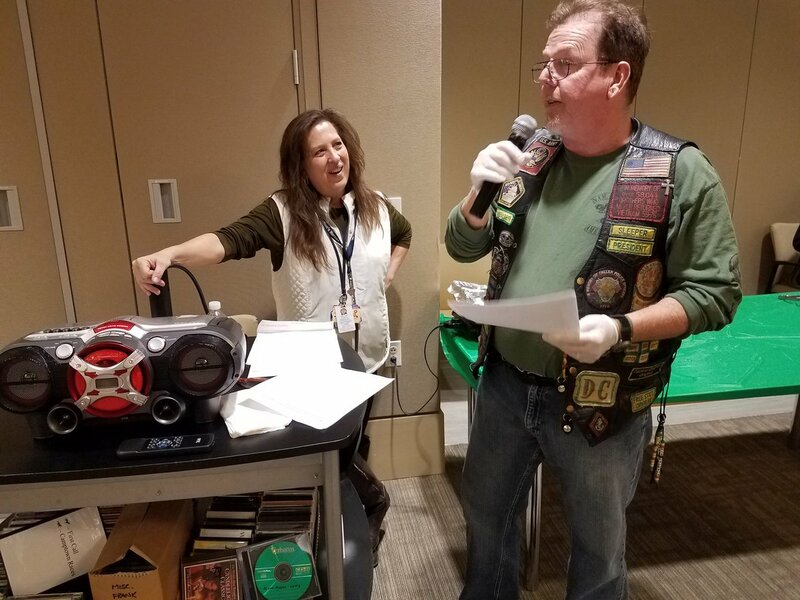 Pete from Nam Knights told a few jokes along with the main entertainment of the night — Home staffer Carol, who shared witticisms and stories and held contests. The incomparable resident Ray spun the tunes for all to enjoy. We would love to see you at an upcoming event! 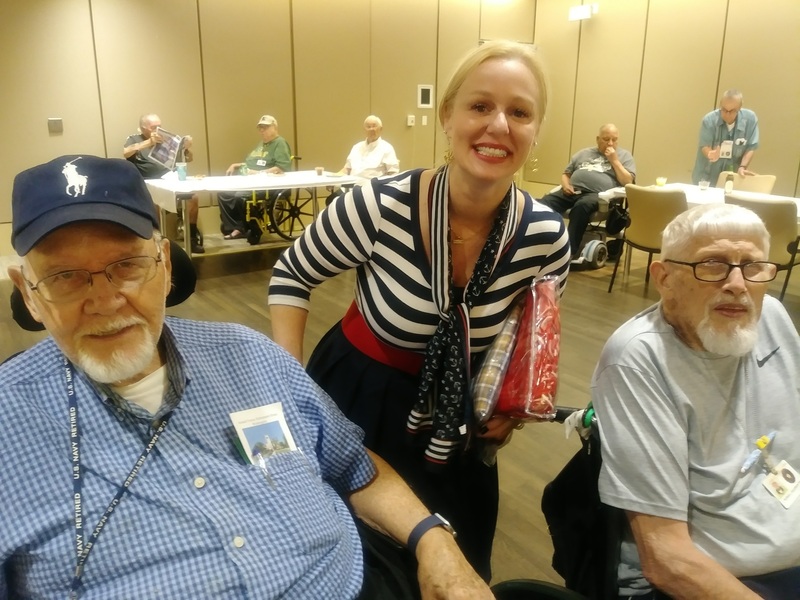 To join Happy Hour or volunteer with Friends of the Soldiers Home, write FOSH Volunteer Coordinator write Lori Lincoln at volunteerfriendsofsoldiers(at)gmail(dot)com. Photo and words by John Hughes. 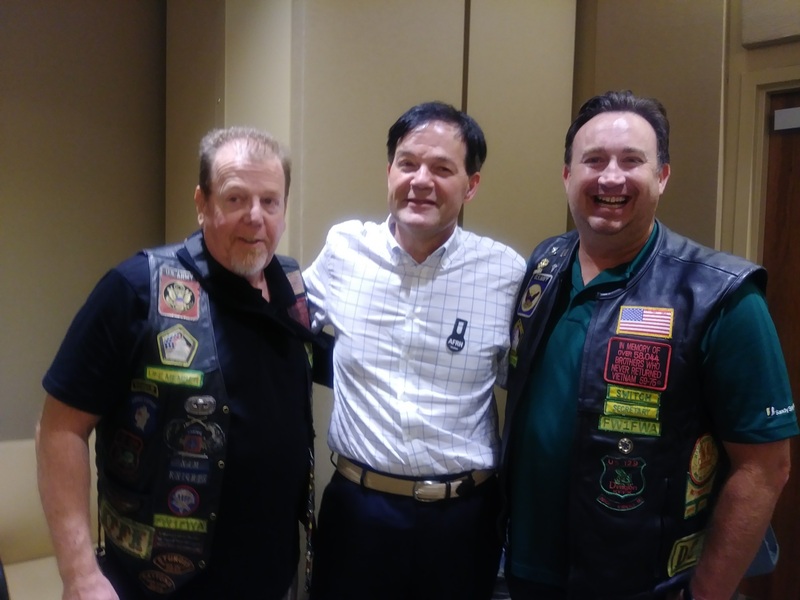 Friends of the Soldiers Home and Nam Knights Capital Chapter love to partner in volunteering for Happy Hour on the last Tuesday evening of the month at Armed Forces Retirement Home-Washington. As the photos from the last event show, we finally got a summer opportunity to enjoy Happy Hour on the rooftop of the Scott Building! We were all so glad to be out there, watching the retiring sun, enjoying the breeze, the conversation, the music and so much more. Happy Hour on the rooftop! It couldn’t be better. 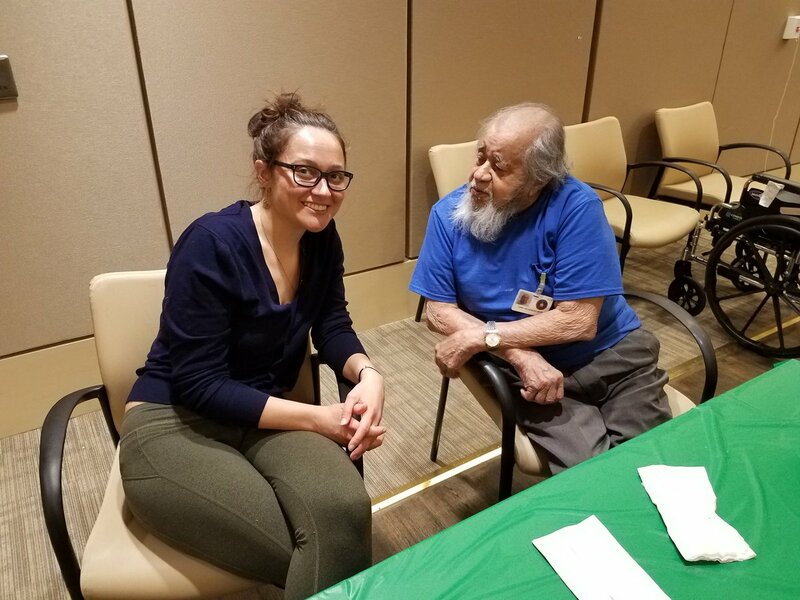 There’s so much we do with the residents, and for the residents – come and join us. 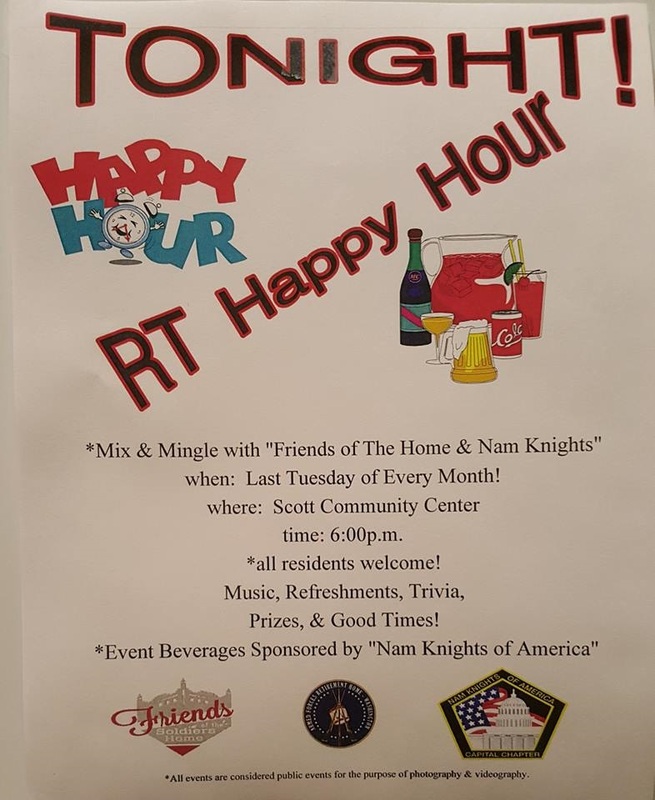 To be part of the fun at the next Happy Hour, write Lori Lincoln at volunteerfriendsofsoldiers(at)gmail(dot)com. Photos and story by Liz Cocke. 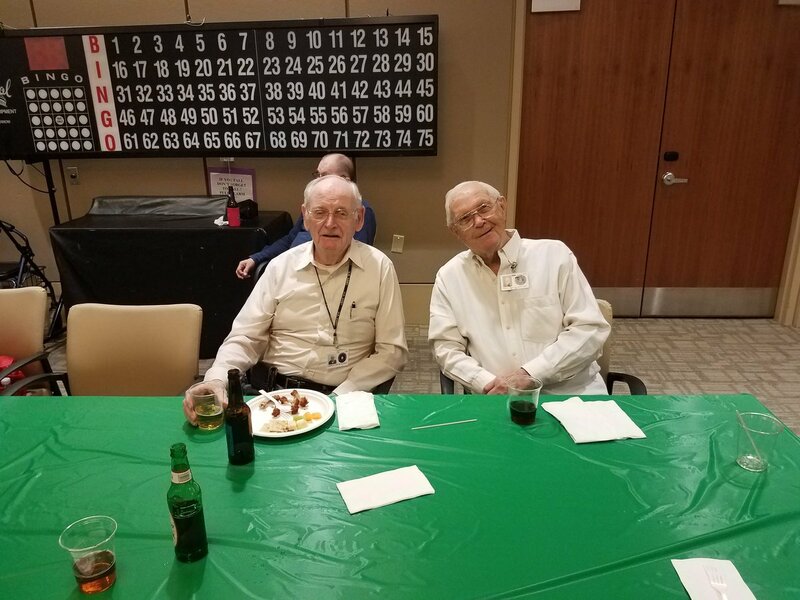 We had a great Happy Hour in late May, with residents, Friends of the Soldiers Home volunteers and Nam Nights. Several of us have been coming so long we’ve started sharing photos with the friends we’ve made at the Home. And who would have dreamed cutting a watermelon could be so much fun! We also had a wonderful time at Happy Hour in April, with family members visiting, young college students ready to dance and too much focus on the bad jokes and general hilarity going on. It was a great evening. See the photos from both events. Come and join us for the next Happy Hour on the evening of Tuesday, June 27 and let’s see if we make it to the rooftop – a great place to bring the residents, share a drink and enjoy a social evening! If you would like to participate, drop a line to volunteerfriendsofsoldiers(at)gmail(dot)com. Everyone enjoyed themselves thoroughly at Happy Hour this week. 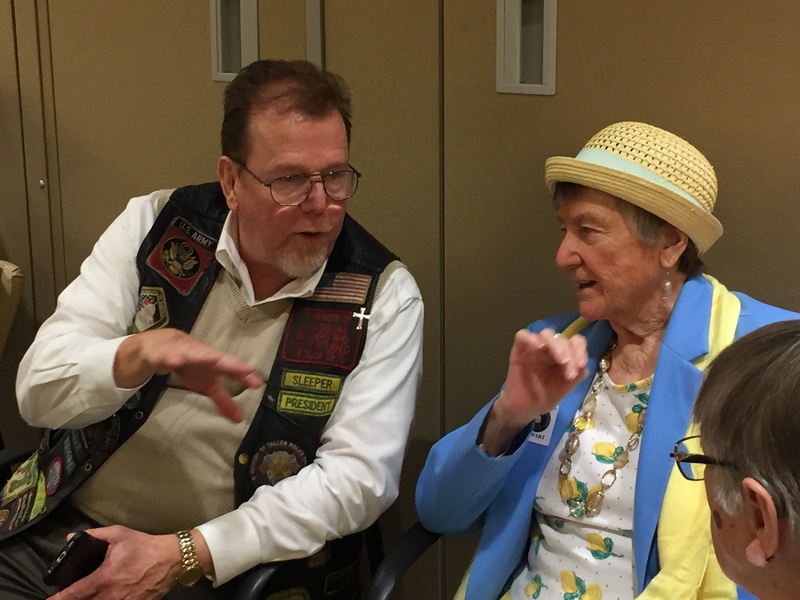 There was more conversation with residents, volunteers for Friends of the Soldiers Home, and telling of jokes. 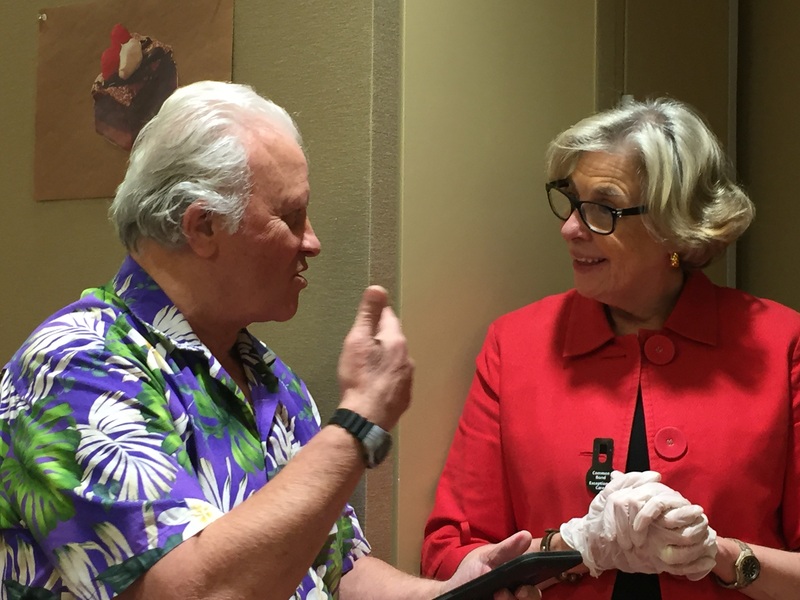 The better jokes came from the residents – not from the traditional emcee! It was wonderful to see so much conversation and enjoyment. 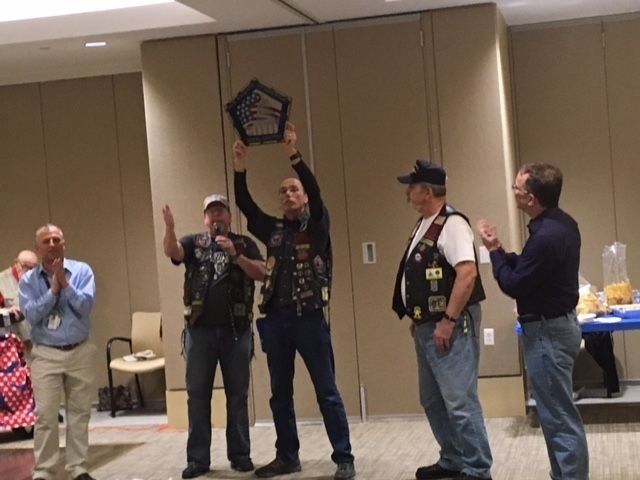 Thank you to the FOSH volunteers who came out and to our good friends, the Nam Knights Capital Chapter. Come and join us at next month’s Happy Hour – the days will be getting longer and the laughter louder! This has been a hot summer at the Soldiers’ Home! We’ve been inside every Tuesday night we get together for Happy Hour – but that hasn’t tamed the good times. 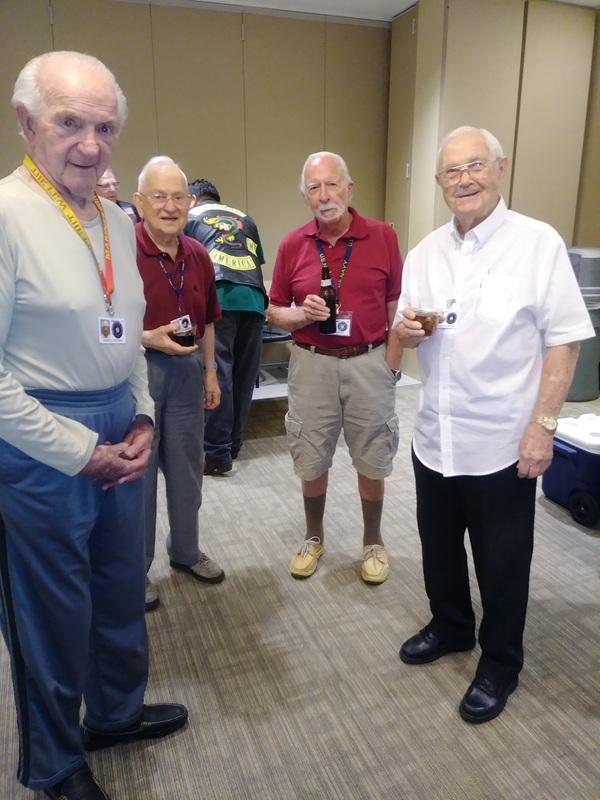 With the Nam Knights serving drinks, Points of Light joining us to enjoy, and so many of the residents coming down to enjoy a good time, the Friends of the Soldiers Home helped create a great party. Come and join us this Fall as we enjoy the last Tuesday night of the month at Happy Hour with the residents. Write volunteerfriendsofsoldiers (at) gmail (dot) com to learn more.